Carrot cake is one of my all-time favourite cakes. It’s moist, rich in flavour and whether you like it or not, gives a lot of energy. 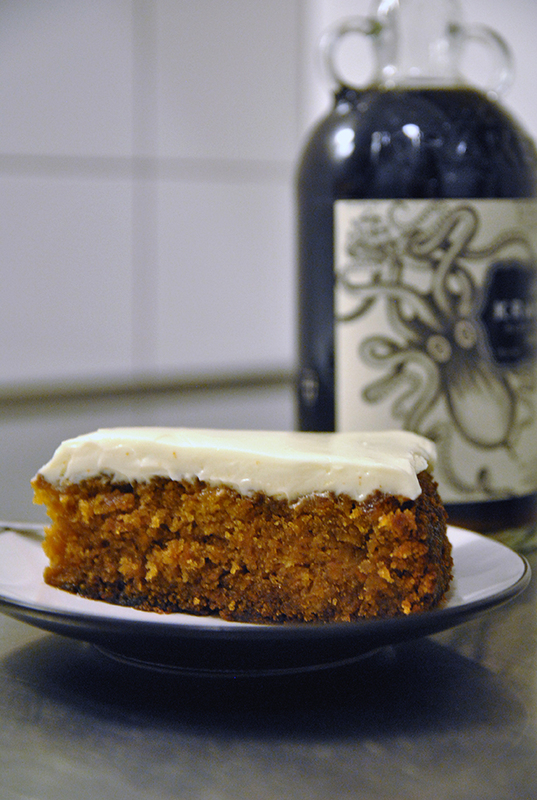 This Friday evening cake is boosted with black, spiced rum. Combine sugar, syrup and oil. Stir with a wooden spoon and mix in the eggs. Combine the dry ingredients and add slowly into the dough. Add grated carrots. Pour the dough into a spring form pan and bake for half an hour in 175c. Cover the cake with aluminium foil and bake for an hour. Take the cake out of the oven and sprinkle the rum on top of the hot cake. Take the cake out of the form once it’s cool. Whisk the cream cheese with the powdered sugar and coat the cake.